Moti Mahal is a traditional Indian take-out restaurant that was founded in 1976 by Davinder and Gurjit Singh Chada. Davinder and Gurjit were married in New Delhi and they moved to Toronto in 1971. Many of their Canadian friends said Davinder’s cooking was so good that she should open a restaurant, so the couple took out a $5000 loan and rented out a shop two doors down from the Naaz Movie Theatre. On day one, there were line-ups out the door and they’ve never looked back! 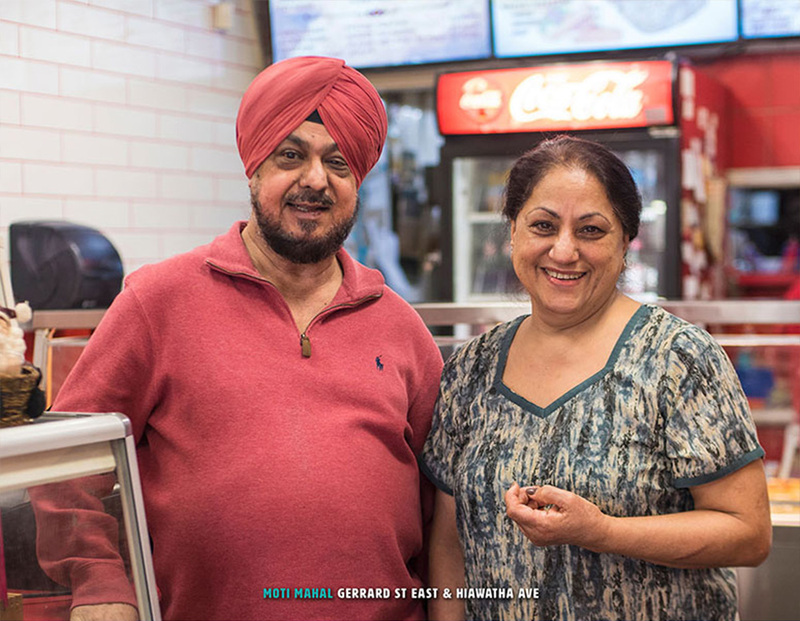 In less than one year, Davinder and Gurjit were able to purchase the building and they have been working there ever since, for over 40 years! Their top food items are chana bhatura, malai kofta, thali platters, chicken tikka naan and kathi kabab rolls. photo © Jared Miller for Village of Dreams Productions Inc. This photo was taken as a part of a promotional poster campaign for the WHAT’S YOUR BAZAAR MEMORY? photo and story sharing contest. Join us in preserving our South Asian Heritage!